Shortcut for a XmpTextValue auto pointer. 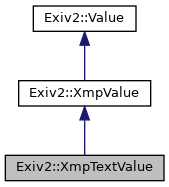 Value type suitable for simple XMP properties and XMP nodes of complex types which are not parsed into specific values. Uses a std::string to store the value. Read a simple property value from buf to set the value. Sets the value to the contents of buf. A optional keyword, type is supported to set the XMP value type. This is useful for complex value types for which Exiv2 does not have direct support. Convert the value to a float. The optional parameter n is not used and is ignored. Convert the value to a long. The optional parameter n is not used and is ignored. Convert the value to a Rational. The optional parameter n is not used and is ignored.